I’m back with another fun DIY lawn game for you! This is the perfect time of year to be making these guys because, while we’re still in the thick of summer, tailgate season is right around the corner! I cannot wait to host a football party and invite some friends over to try these new games with us. Last time we talked about our DIY lawn dice (so! fun!) 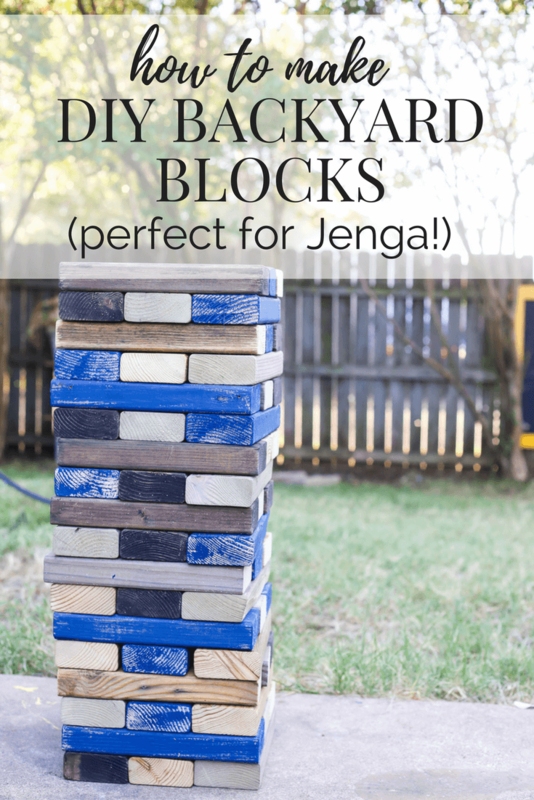 and today we’re going to talk about the backyard blocks we made – they’re perfect for playing Jenga! 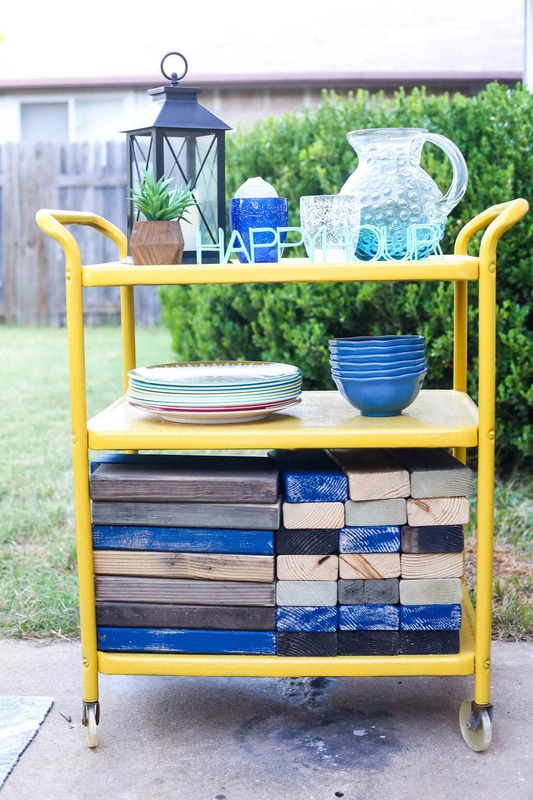 Psst – If you’re looking for other DIY outdoor furniture or game ideas, look no further! 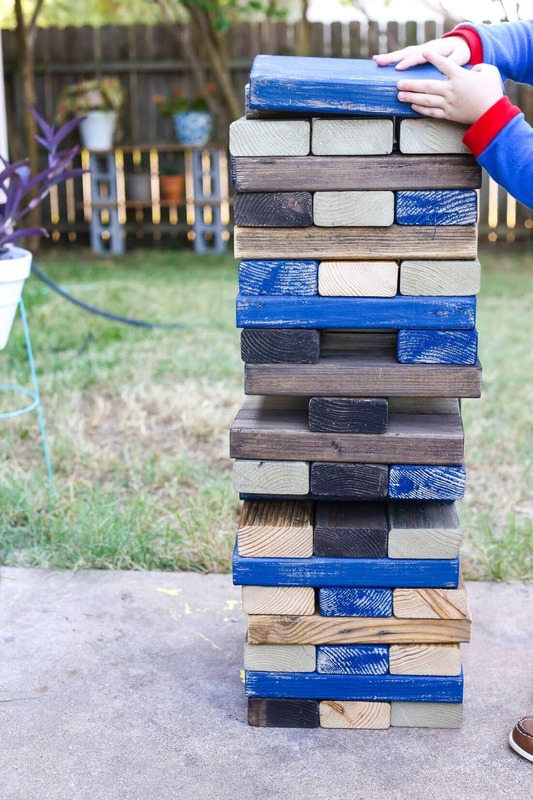 I’ve been wanting to make some of these blocks for a long time – not only are they great for Jenga (which is the perfect game for family gatherings because even Jackson, our 3-year-old, understands how to play) but they’re also great for kids to just play with. 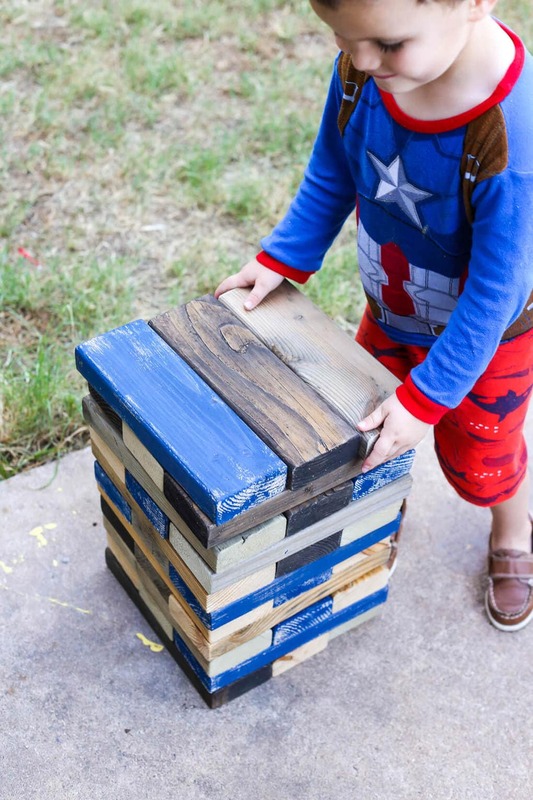 Jack loves blocks and something about making them mega-sized makes them way more fun to play with – plus, they make a bigger crash when they fall. What is it with toddlers and building things just to knock them over? These are incredibly easy to make, but a little time-consuming thanks to all of the sanding (I did it myself in about half a day). Just find a good podcast to listen to while you sand and you’ll be good to go (I’ve been listening to Homecoming – have you heard it? So good!). The first thing you’ll do is cut your blocks. 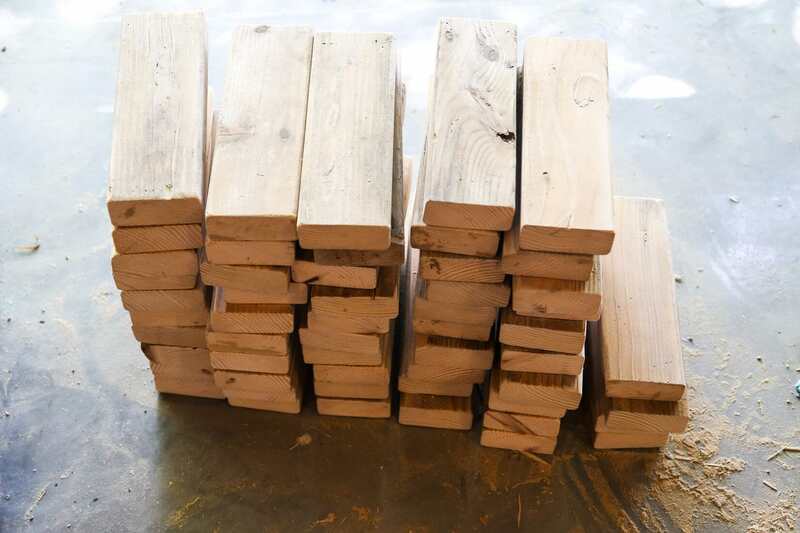 A little research told me that the typical Jenga block is 3 times longer than it is wide – and a 2X4 board is actually 3.5″ wide, so I cut my boards to 10.5″. 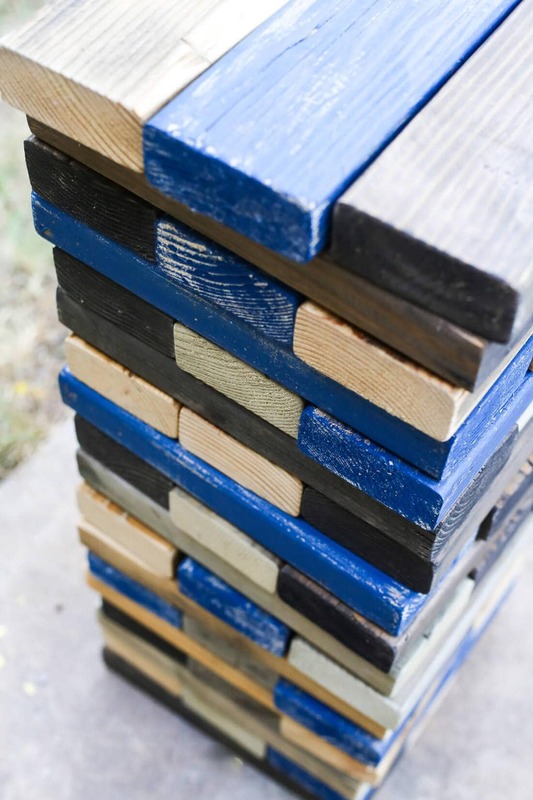 You’ll need 54 of them for a standard Jenga game. Yes, fifty-four. 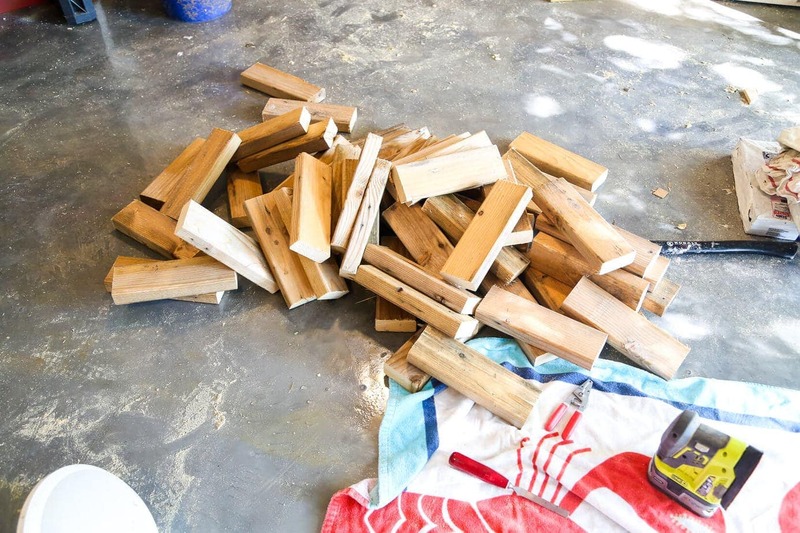 Once you’ve got them all cut, it’s time to sand. 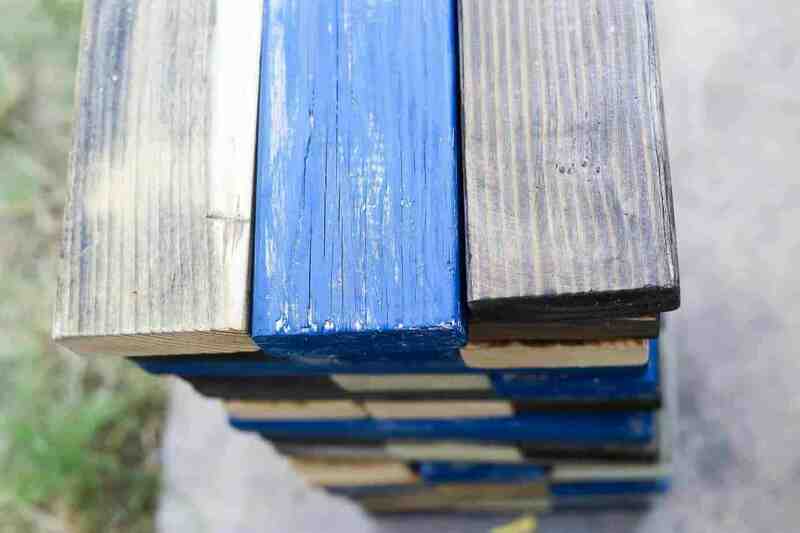 Be sure to sand all sides really thoroughly – you want the blocks to be very smooth so they can slide easily. 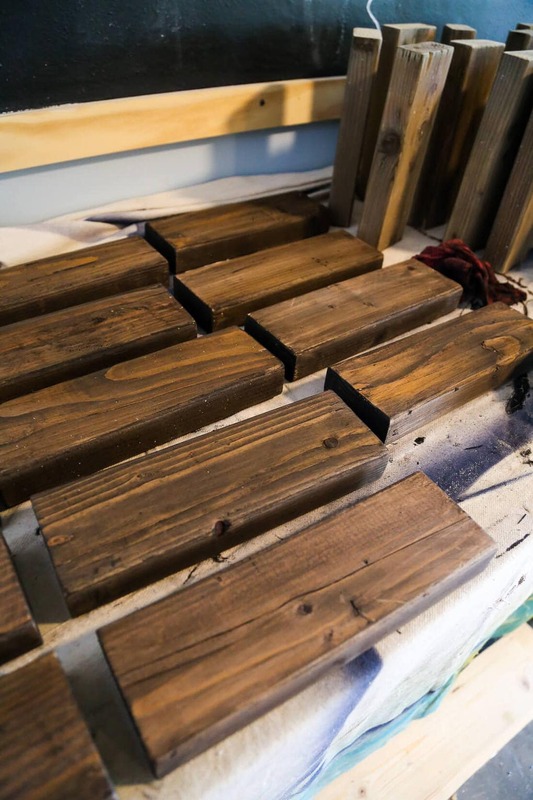 For my blocks, I used boards that were old and weathered (they were saved from demolishing the wall in our garage and had been outside for a while, so they’re nice and rustic-looking…and needed extra sanding!). It feels like forever at the time, but it really only took me about an hour and a half to get all of the boards completely sanded. Oh, and pro tip: make sure you have a lightweight sander. We have a couple of different power sanders but I used this one for this project and I can’t imagine using anything else. Our other ones are much bigger and bulkier, and my arm would have been so much more tired if I had used those! 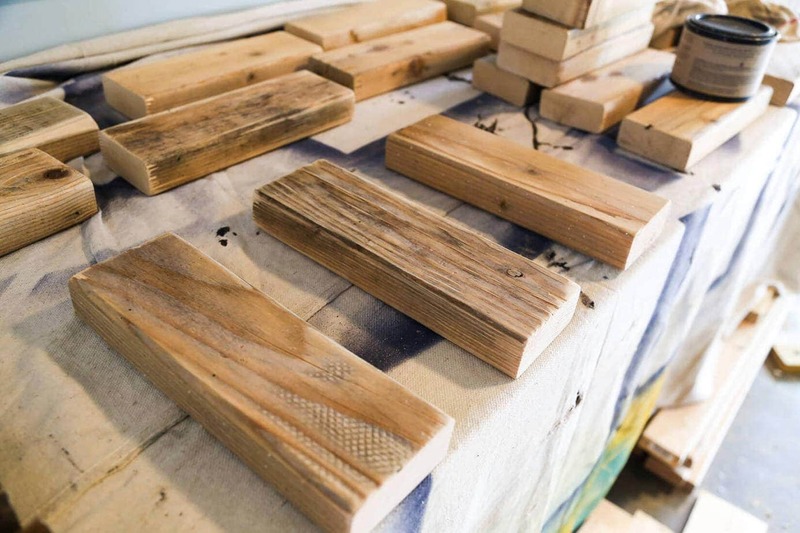 Once your boards are all sanded and cleaned off, it’s time to finish them. I went with four different finishes for a mismatched look, but you can obviously do whatever you want here. If you’re curious, I used this stain (but this is a cheaper version of the same color), this stain, this oil, and a really rough coat of a sample pot of blue paint I had leftover from painting the workshop. Once everything was all nice and dried, it was time to play! I decided to store our blocks on our bar cart – the bottom shelf is the perfect size to hold ’em all and it makes it easy to access them when we want to play. I was impressed at how quickly Jackson picked up the game – he absolutely loves it and asks to play all the time now. I was a little worried about how easily the blocks would slide out, but it functioned just like the regular game. The first time we played, he had a competitive streak and wouldn’t let me help him until it got really hard to find a safe piece, and he thought it was hilarious when the tower finally crumbled. The second time we played, however, the tower fell on his turn and you would have thought the world ended. The tears! The screaming! The drama! Kid doesn’t like to lose. Side note: Please ignore my child’s ridiculous outfit. He insists on wearing pajamas 90% of the time now, and he also insists on never actually wearing matching pajamas. Toddlers. What can you do? Anyways. Jenga. This is a really fun game for everyone in the family and I highly recommend making yourself some of these! You can buy them yourself, but they’re surprisingly expensive and not nearly as cute as the DIY version. What games do you like to play in your backyard? Any great ideas for what we should make next?! 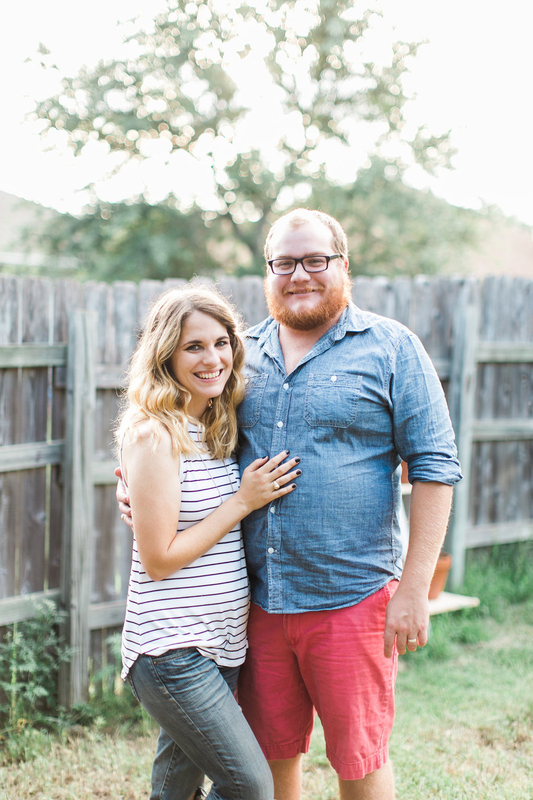 Be sure to follow along on Facebook, Instagram, and Pinterest! What a great list! We are going to have a try a few at our next backyard cook out! 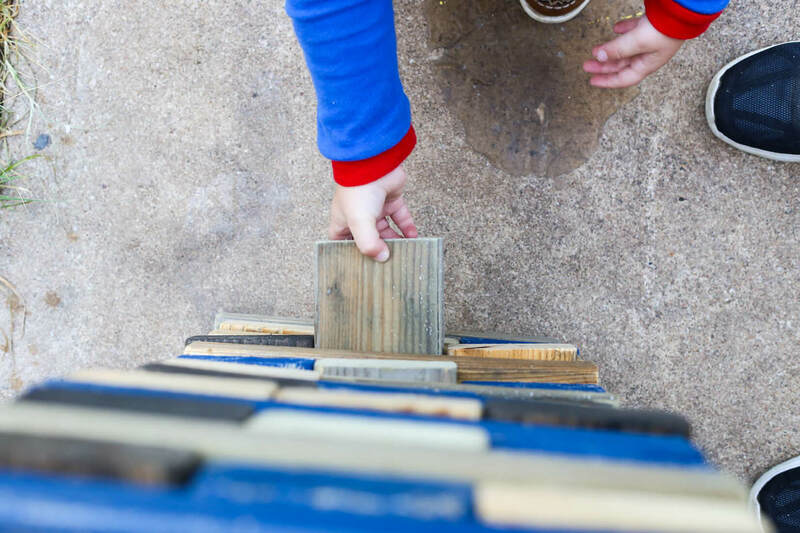 DIY is a fun way to build something with your hands, save some money, and have fun at the same time! Thank you for games easily and cheaply done using IMAGINATION, not a smart phone. This sounds like a ton of fun! My family loves board games, but life size versions are always better. I can’t wait to try it! What a great way to keep kids happy outdoors! Love it. Tweeted it. Thanks for sharing!